Fuerteventura is roughly 600 square miles in size, making it the second largest island in the Canaries. The most easterly of the group and located only 55 miles from Morocco, this popular island attracts thousands of visitors throughout the year. On the same latitude as Mexico and Florida, the weather conditions are very similar and Fuerteventura boasts over 3000 annual hours of sunshine which equates to an average eight hours per day, so it’s definitely the place to visit if you need some sun. 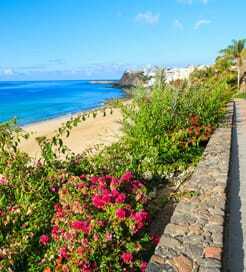 Getting around the Canary Islands by ferry in general is relatively simple and Fuerteventura itself is reachable directly from neighboring Lanzarote, Gran Canaria and Tenerife. The island is served by the most popular ferry companies in the region including Fred Olsen and Naviera Armas who operate many crossings each day. Although there is no direct crossing from mainland Spain to Fuerteventura it is possible to travel to one of the other Canaries and pick up a connection there. If you don’t arrive by car and don’t fancy hiring then no problem, getting out and about is still easy. Many people rent a bicycle as Fuerteventura is known as being an ideal place for road or mountain cycling due to its landscape and climate. All types of bicycle can be hired, including mountain bikes, professional road bikes, trekking bikes and children's bikes. If that sounds too energetic for you, the local buses come recommended and are used by both visitors and locals as they are very reliable and cheap too. Visitors to Fuerteventura will find mile upon mile of white sandy beaches with turquoise sea. A beach lover's paradise, the island features the longest coastline of all the Canary Islands. Corralejo in the north has lots of golden sand dunes, whilst in the south, at Jandia, there are miles of flat sandy beaches to enjoy with the kids. There is plenty to do besides sunbathing. If you love the water then you’ll be spoilt for choice when it comes to water sport activities. You can go surfing and boogie-boarding, kayaking and snorkelling or even kite surfing for those wanting to try something different. Those with kids should visit the Oasis Park which is a zoo and botanical gardens located in the south of Fuerteventura. There’s a good choice of golf courses to try at Fuerteventura too, ranging from a challenging venue in Costa Caleta to a 9 hole course in Corralejo. If you’re heading out for the evening then the Centro Comercial Atlantico located on the main strip in Corralejo is where you will find the best choice of pubs, bars and live music. Those wanting something a bit more relaxed should head over to the northern end of the main Avenida. This area is pedestrianized and has a choice of restaurants and small bars. For more information, please visit our Ferries from Gran Canaria to Fuerteventura page. 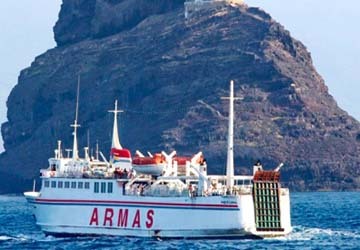 For more information, please visit our Ferries from Lobos Island to Fuerteventura page. For more information, please visit our Ferries from Lanzarote to Fuerteventura page. For more information, please visit our Ferries from Tenerife to Fuerteventura page.